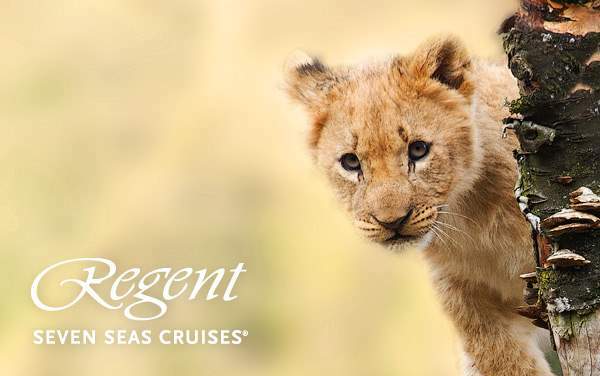 All of Regent Seven Seas Cruises’ luxury staterooms are suites and offer beautiful amenities and extravagant finishing touches like marble bathrooms. 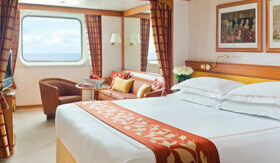 You’ll have the best sleep of your life on their Suite Slumber beds. Sail the world over with all the touches of home, from an expansive living room and walk-in closet and a marble clad bathroom. This incredible space comes with extra services like an iPad and Hermes amenities. 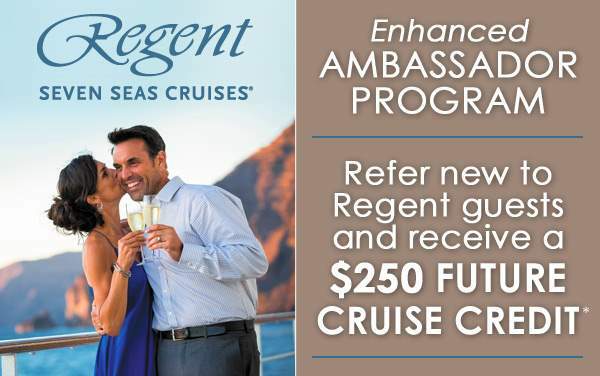 When you book a Grand Suite you also have access to Regent Seven Seas Cruises’ Concierge amenities, like a cashmere blanket and in-suite binoculars. 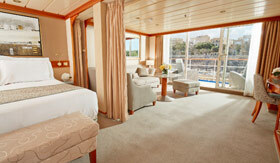 This is in addition to a beautiful set of rooms and a private balcony. 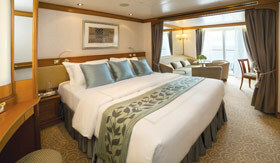 On each of Regent Seven Seas Cruises’ ships you can stay in the ship’s beautiful and airy namesake suite. 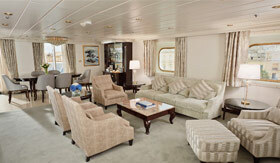 Included in these suites are butler service and an interactive flat-screen TV. 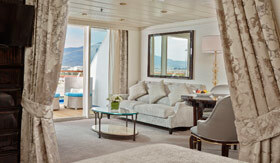 Regent’s Seven Seas Suites are perfect for the guests who like to entertain. 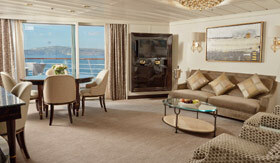 The Seven Seas suite has a sitting area and a dining table perfect for sharing your daily canapés. 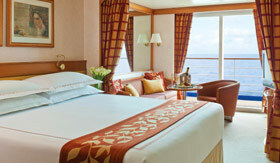 Really get an incredible view of the ocean on your private balcony where you can lounge from morning till night. And don’t worry, room service can deliver your meals. 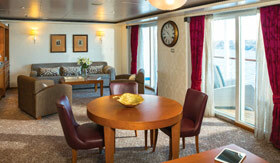 There are several Penthouse layouts aboard Regent’s luxury ships, all of which are spacious and provide you with all the luxuries you could want, including butler service. 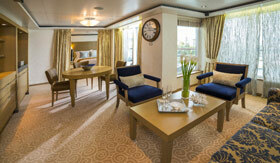 Complete with concierge amenities, your Concierge Suite is a splendid choice to make your home away from home onboard your Regent Seven Seas Cruises voyage. 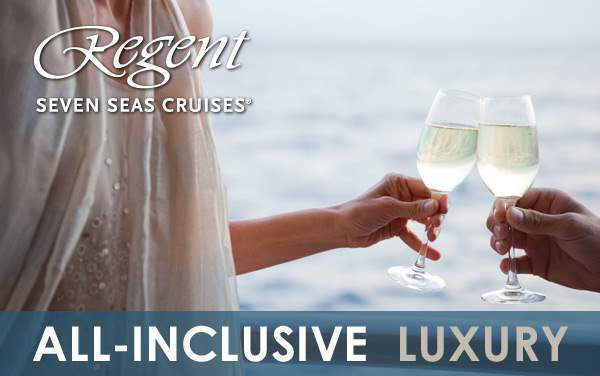 With a Suite Slumber bed and a gorgeous private balcony, you might consider never leaving your deluxe suite, if not for the amazing destinations waiting to be explored by way of Regent Seven Seas Cruises’ complimentary shore excursions. You’ll want for nothing when sailing in a Window Suite, where your refrigerator is fully stocked and you can lounge in your Regent bathrobe and slippers after a relaxing shower.